Freddie Timms c. 1946 was born at Police Hole, Bedford Downs in the East Kimberely region. The fiery tempered young stockman, also known by his bush name of Ngarrmaliny Janama, or "raging bull" worked on Bow River Station and at Lissadell Station before he and his family were relocated to the Warmun community at Turkey Creek in 1985. 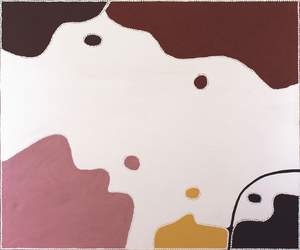 Beginning his artistic career in 1989, Timms has since exhibited in several shows at William Mora Galleries, throughout Australia and overseas. 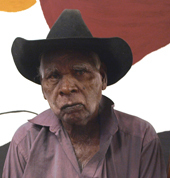 Timms was inspired by the knowledge and techniques that he learned from living and working alongside the other stockmen and artists such as Jack Britten, Hector Tjandany, Henry Wambini, the late Rover Thomas and his own father-in-law, George Mung, who, with Paddy Jampinji, were the finest of the earlier Warmun / Turkey Creek painters. Timms bases his painted portrayals of his country on actual topographical features instead of exploring ancestral mythological themes, choosing instead to focus on the landscape's history and evolution since colonisation. Many of Timms' paintings are stories of exploitation, alcohol and violence. He often seeks to impart his political views through his paintings. The artist paints with sparseness, often using just a limited palette of ochre and oxide pigmented colours. Many of his pictures are simplistic topographical representations of the remote areas in which he lived and worked. Rich colours capture the essence of the land: black soil, red and sandy earth, and water holes, layered with historical and spiritual themes of dreaming places. Recently Timms began painting depictions of Ned Kelly, an important part of the Kimberley dreamings. Today, Timms is the chairman of Jirrawun Aboriginal Art Corporation and paints his stories from the quiet home he shares with his artist wife Beryline Mung in the small community of Frog Hollow. Timms’ work is represented in major collections throughout Australia and has been shown in galleries in Germany, Tokyo, Chicago, Paris, Auckland and Miami. Collections include National Gallery of Australia, Canberra; Art Gallery of Western Australia; Art Gallery of South Australia; Art Gallery of New South Wales; National Gallery of Victoria and the Aboriginal Art Museum, Utrecht, The Netherlands.